There used to be loads of blackberries on this trail. I remember a year when we picked two full ice cream buckets full. Today we each carry a bucket in hopeful anticipation, but it seems to be overkill. Where are the berries? I’m at the cabin, with my sister Betsy and her husband Bill visiting from New York. Deciding to hike the nearby trails in Suomi Hills, I see a good opportunity to take stock of the berry status. 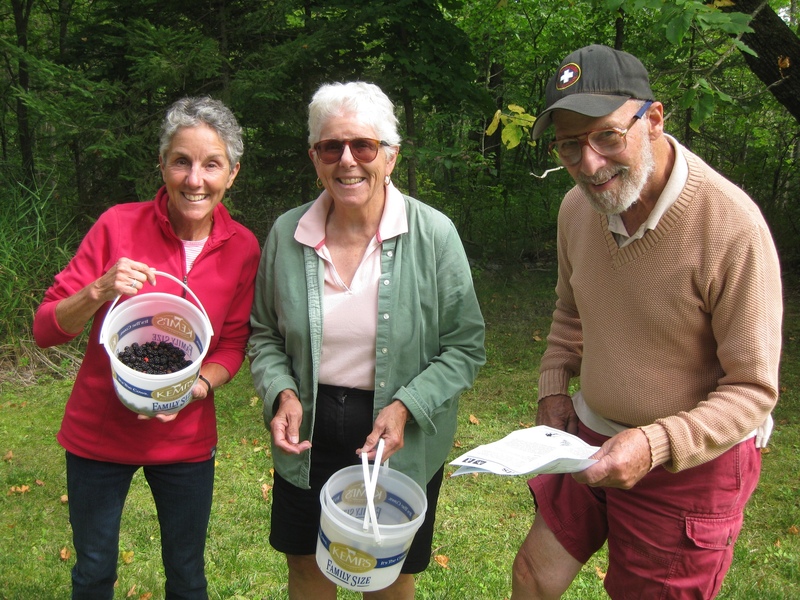 Normally we pick blackberries over Labor Day weekend, but just in case we tote buckets on this foray. The trail is overgrown with high grass and thick foliage. The well worn path in my memory has disappeared, but is still navigable. The side growth is equally dense, packed with tall bushes, ferns and vegetation that is not blackberry vines. Long past the point where I once found the first blackberries, I spot some. Sparsely intermingled with the other plants, they are far from abundant. The vines we do find are anything but ripe. They range from green immaturity to pinkish red “getting there.” We call them vines with plenty of potential. Just now, they hold only one or two fully ripe blackberries ready to fall from the grasp of the vine. And we claim them. Oddly, others look past their prime. They have either lost their berries already or literally withered on the vine into hard brown dried up knobs. Our harvest is meager. The hike turns into a stroll. A search for the berries. Eyes scanning the undergrowth, we seek out our treasure. Farther along the path, the blackberry presence multiplies. More ripe berries per vine, more vines per square yard. Hope is renewed. Venturing into the brush to reach the more succulent fruit, the persistent thorns tear at our clothing and skin. We are ill clad for this endeavor. Sweaters and fleece are prime targets, catching on the least of the prickers. Exposed skin below our shorts take the brunt of the sharp barbs, bearing scratches in all directions. But still we pursue those berries just beyond our reach. In the deep thickets, there is evidence of those who have preceded us. 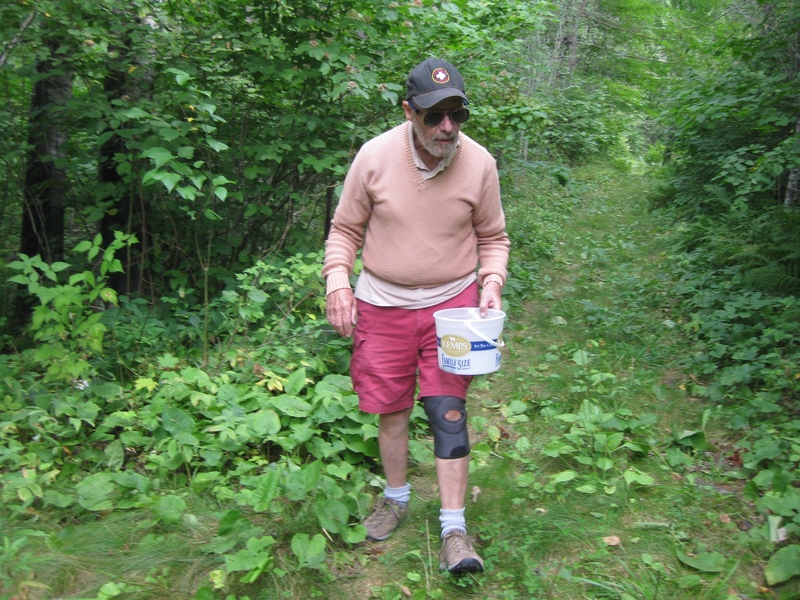 They leave behind large swaths of trampled vegetation in their efforts to reach the berries beyond reach from the trail. I call them elephant tracks. Making no effort to walk with care, these foragers leave destruction in their path. Unkindly, I am convinced the culprits are of the human variety. Berry pickers with no consideration for nature. I dismiss the possibility that it could be animals on the same hunt. These blatant paths lead to more blackberries, I’m certain. And I make a mental note to pack my hiking pants and a windbreaker for my next trip to the cabin a week hence. Because I will be back. Hopefully my timing will coincide with the next round of ripening. And I will be fully equipped to reach the farthest berries. When I follow the elephant tracks. The morning was getting long and our reserves were running short. The light snack we'd eaten before leaving was a faint memory. 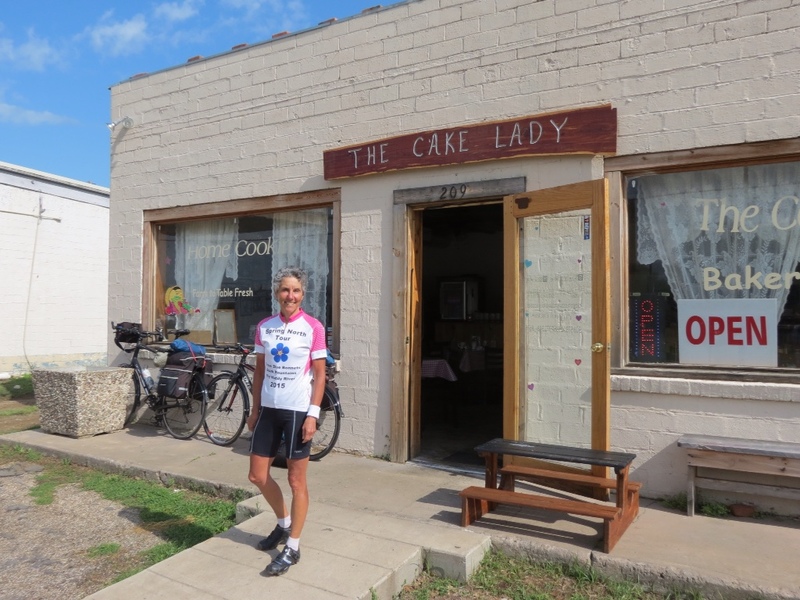 We knew it would be 31 miles before our first opportunity for a real breakfast and we were anxious to reach that milestone. 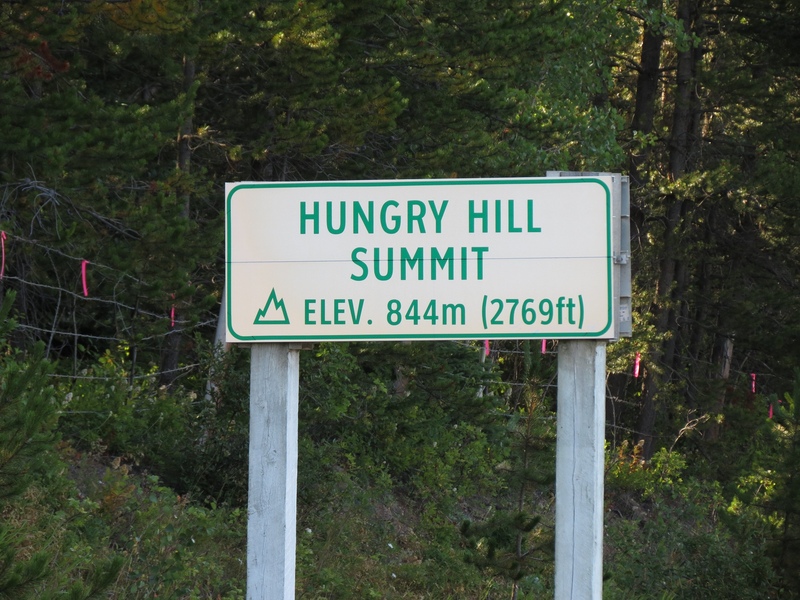 There were several good climbs to conquer en route, and one of them seemed particularly appropriate. Despite our cravings, the ride was exceptional. With clear skies we could see forever, particularly the wide vistas that spread out from the hilltops. It was obvious that we were getting closer to the coastal mountain ranges. 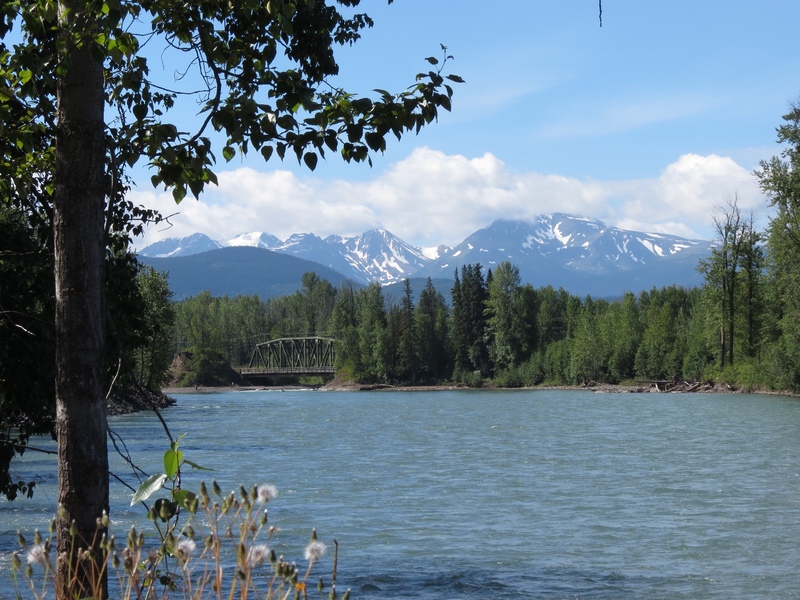 When we reached the small town of Telkwa, the options were iffy. Our target cafe turned out to have a new closing day – that day. The only other choice was a bakery on the far end of town that Google said was closed. 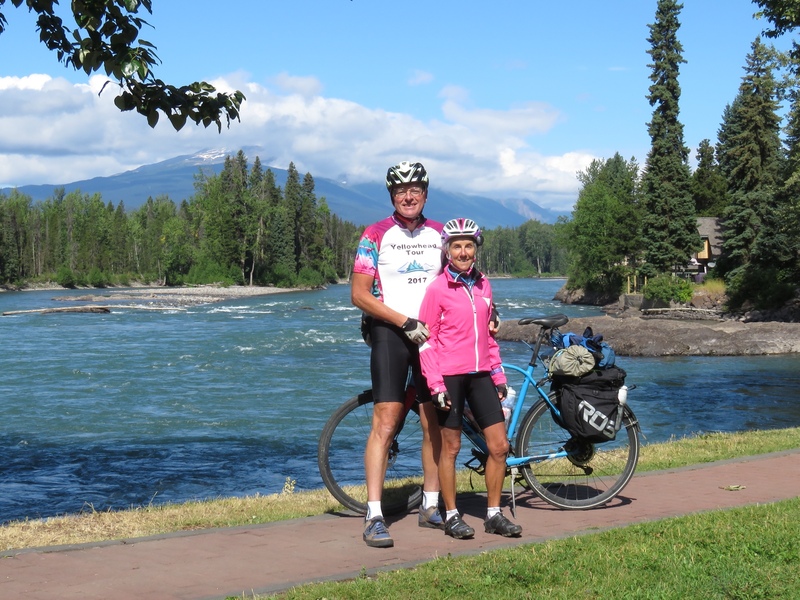 Resigned to cycling another 12 miles for food, we continued on. By this time we expected little from Telkwa. So it was a pleasant surprise to find an attractive town park. It immediately beckoned. 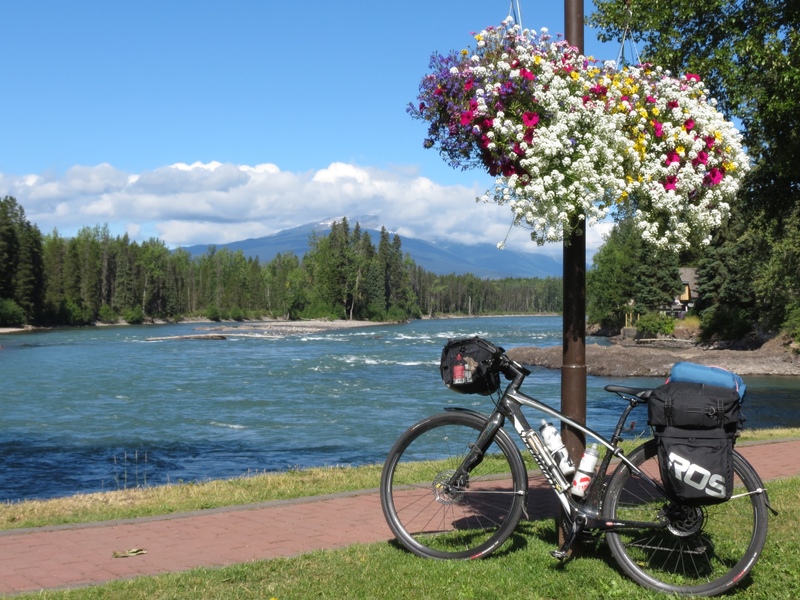 Crossing a carefully manicured lawn with flower baskets erupting in a rainbow of blooms, we reached the Bulkley River. Its wide expanse churned as it rippled over rocks and flowed onward toward the mountains. Like most rivers we have seen on this tour, it was light green in color and extremely clear. Rich said that just the sight of that water was rejeuvenating. Google's picture of the bakery was a bland building attached to a gas station. Not at all appealing. But Google was wrong on all accounts. Upon approach, not only was the Baeckerei Kaffeehaus a well kept place decked out with flowers, it was open and served meals. Little did we know, the best was yet to come. The Caribbean proprietor did all the baking himself, and had a menu of imaginative and locally sourced organic dishes. Everything was freshly prepared, and Rich raved about his breakfast sandwiches which oozed hot ingredients on crusty homemade English muffins. My quiche was hot and fluffy with a light flakey crust that melted in my mouth. We also shared an enormous decadent multi-berry muffin. Some meals leave you filled and merely satisfy your hunger. This one fed our souls. It was so unexpected. I'm glad we didn't trust The Google. It's really hit or miss. 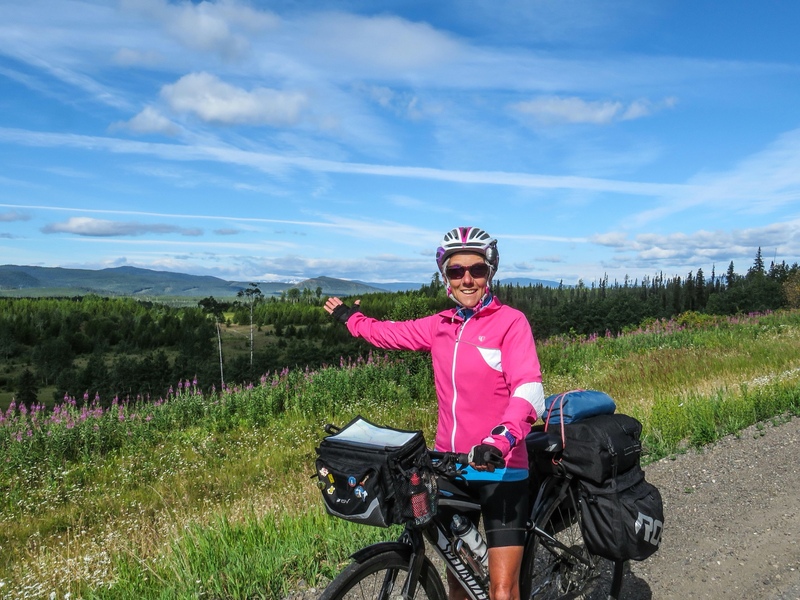 When bike touring, we don't plan very far ahead. A day or so for lodging and hours or minutes prior to looking for a meal. Google reviews or consulting TripAdvisor is sometimes helpful, but nothing is guaranteed to be accurate. So finding those hidden gems with folks who deliver exceptional service is often pure happenstance. And we've had a run of good luck recently. Take The Cake Lady. 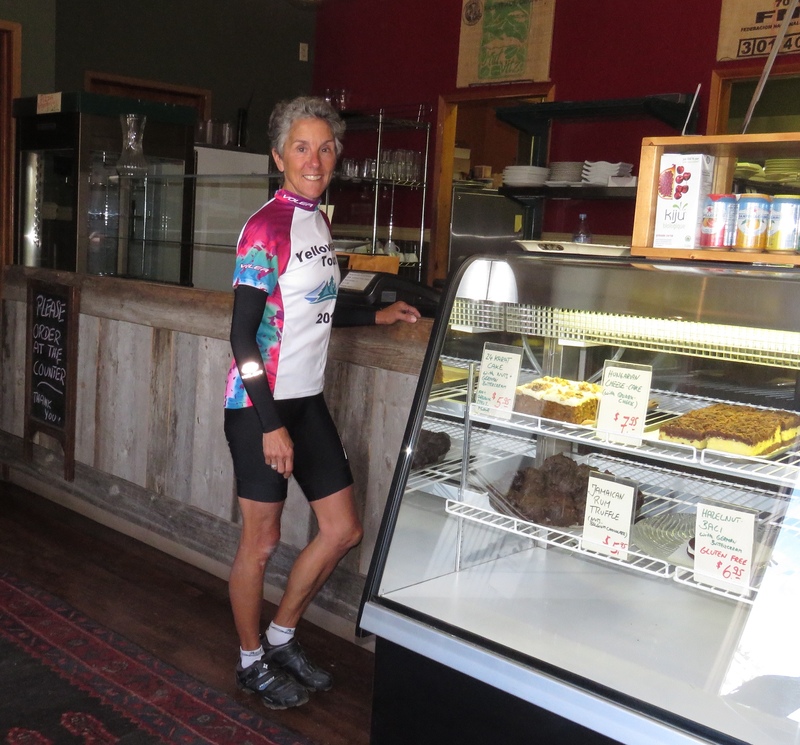 Her bakery café in Mt. Vernon was the only place we found open, so our breakfast decision was made for us. The spotlessly clean and spare room bore no hint of the quality of the meal to come. Everything was simple but home made, down to the freshly chopped and cooked potatoes which Rich declared the “best ever.” I gratefully accepted the healthy alternative of fresh tomatoes, which was a nice touch. But the best was yet to come. With our large, moist biscuits hot out of the oven, she brought out a large canning jar of strawberry jam – from freshly picked berries and made just the night before. It was like spreadable sweet sunshine atop those tasty biscuits. I just had to request a second one. Just outside of Clarksville, we came upon yet another Historical Marker. But this one was unlike all the other anonymous plaques. 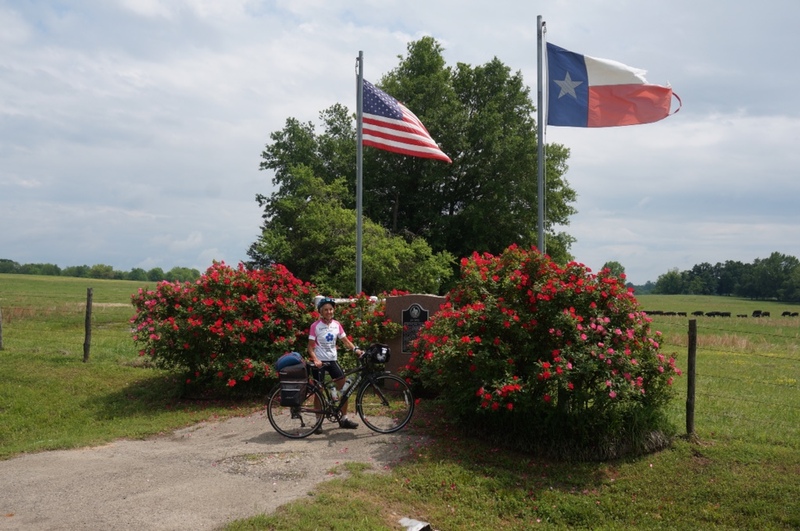 Flanked by both US and Texas flags, and adorned with the bountiful rose trees we have been admiring, we had to stop and check it out. This one was dedicated to Police Officer Tippet, who was gunned down by Lee Harvey Oswald when he stopped him for questioning after JFK was shot. The sight was near the farm where he grew up. This man who gave his life in the line of service was well worth commemorating. Approaching our last night in Texas, we found little to recommend the motel on the outskirts of Clarksville, and independently we each mentally justified the alternative of staying in the town's B&B. It was conveniently located in town and we looked forward to the splurge after some grim motel rooms. 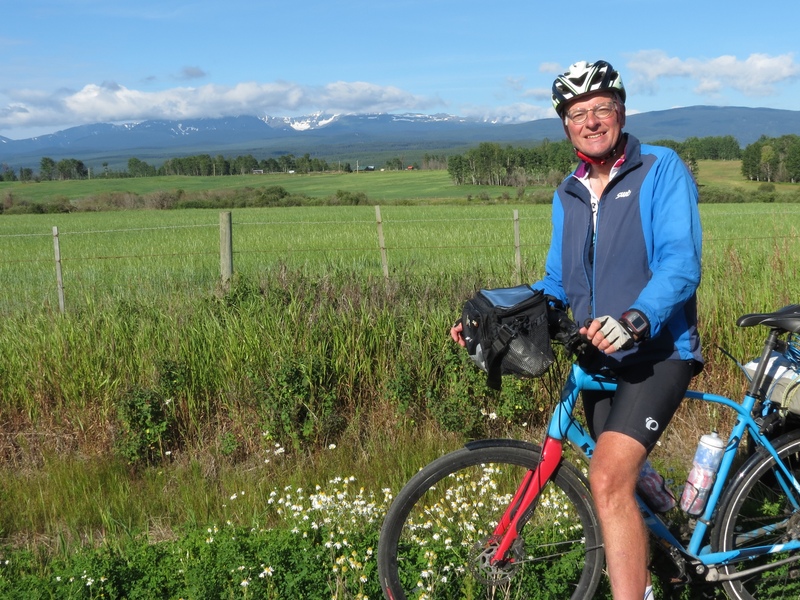 We were greeted with great enthusiasm by Perry, the owner of the Courthouse Inn B&B and instantly knew we'd made the right choice. 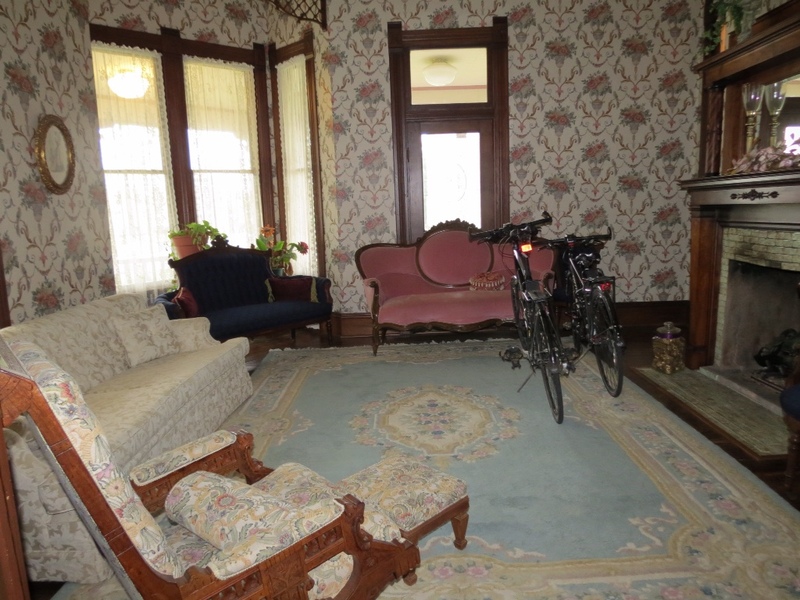 It was more like being welcomed into his home than a formal guest scenario, as he heartily encouraged us to bring our bikes right on inside and saw to our every need. When dinner time approached, Perry came through with a wonderful recommendation for the Italian Bistro down the street. There the young owners not only served up a delicious meal, but provided the best service we've ever had. In fact, they colluded with Perry to make it an extra special meal for us. 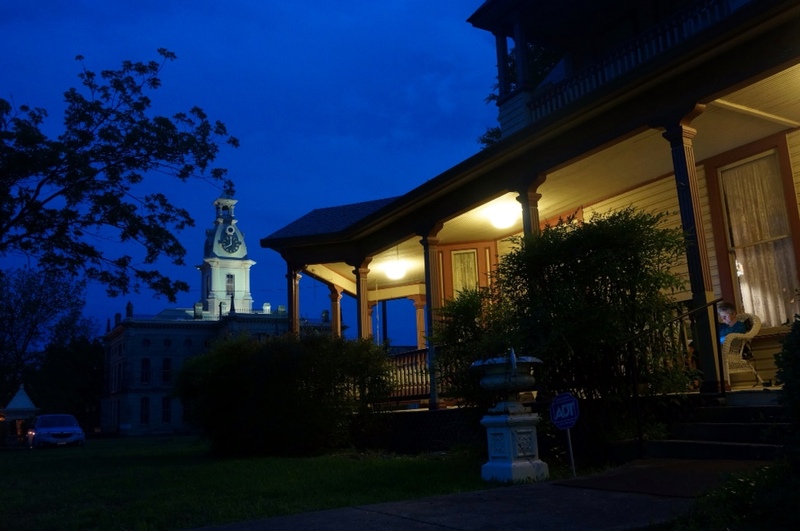 It was such a mild evening that I returned to the front porch of the inn to read until bedtime, while Rich captured the inn, courthouse and me in some fantastic night time photography. It was a luxury indeed to relax the next day while the overnight rains continued into the morning hours. Perry doled out equal amounts of entertaining conversation and story telling with his cooking, and assured us we could hang out as long as needed. They say good service is hard to find these days. We've certainly gotten our share lately. Thanks, folks! There is something irresistible about berries. Especially those growing of their own free will, just steps from our doorway. Begging to be picked. We’ve seen the thickets of thimble berries growing in “our woods” every summer. And each year the birds, critters and perhaps other berry lovers have gotten to them first. This year appears to be a bumper crop. Loads of big red berries hang from the branches, with many more promising to follow. We promised ourselves that this year we’d pick them and make jam. Thimble berries take me way back. 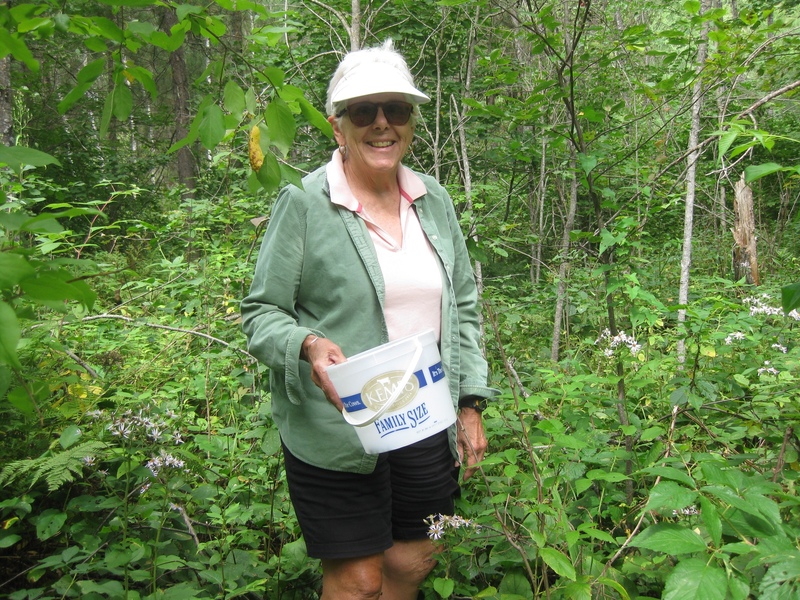 Julie, one of my best friends in school, went blueberry picking each year with her family, and I went along. Not being a real lover of blueberries at the time, I was lured away by the sight of huge red raspberries not far away – something I truly adored. I picked and picked and returned to the others quite smug and victorious. That is until I was informed that I had picked thimble berries, not raspberries. I’d never even heard of them before. I quickly learned that they were not so tasty for eating. But to make up for it, Julie’s mom turned my cache of non-raspberries into a delicious jam. A few days ago it became clear that the time was NOW. At least for the first round of picking. Each bush had one or more perfectly ripe berries. So Rich and I ventured out to see what we could gather. Although it meant only a berry here and a berry there, the bushes were plentiful enough to make it a worthwhile hunt. Moving across the road, we reaped even more berries – enough to come up with 4 1/2 cups between us. And judging by the remaining unripe berries, we could easily duplicate that several times if we keep diligent watch. I had to hunt down a recipe for jam, and was surprised just how simple it was. 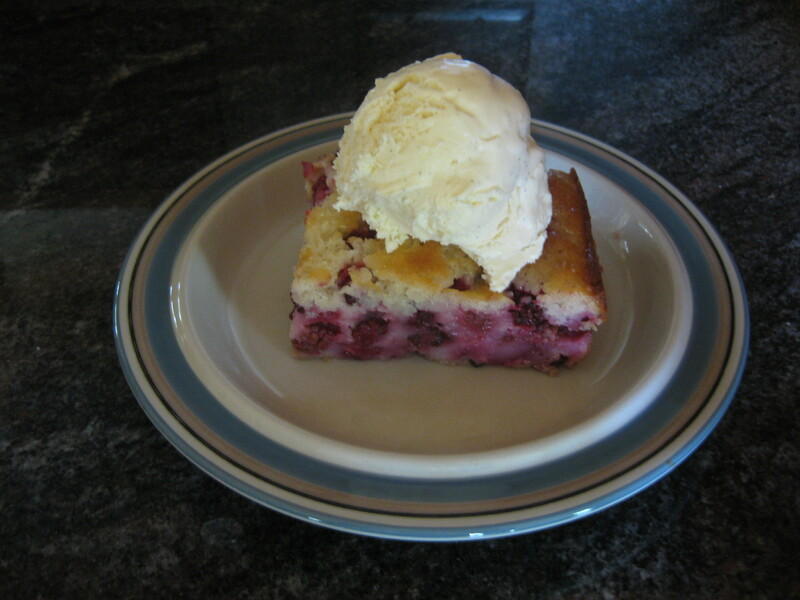 Only two ingredients in equal quantities – thimble berries and sugar. It also warned that cleaning the berries was as time consuming as picking them. I won’t argue that point. 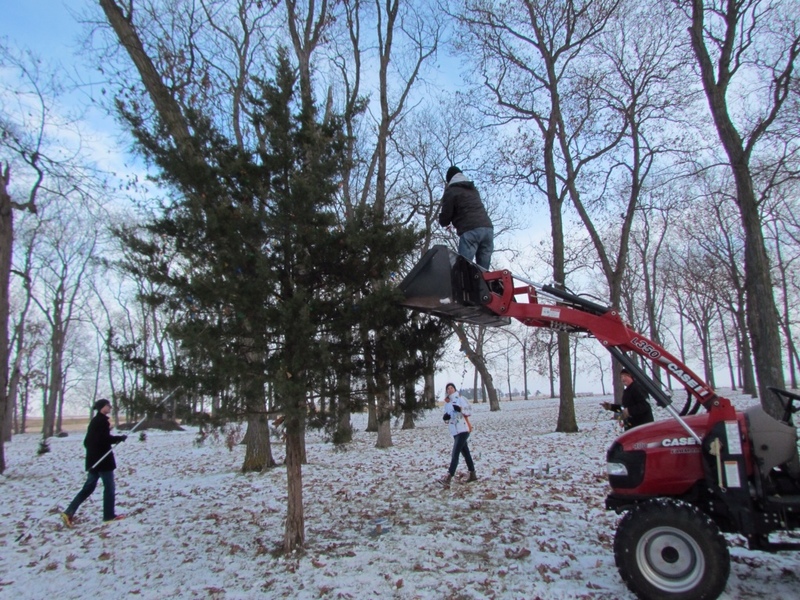 And picking was a lot more fun. I dug out my canning supplies, bought more canning jars and reacquainted myself with the process. Then I dug in. (Notice “we” became “I” at this point…) Soon the house was redolent with sweet berry smell as the mixture simmered on the stove. It wasn’t long before it began to thicken and resemble jam, and filled more jars than I expected. Somehow getting something that good from free fruit is deeply gratifying. Now I suppose I’ll be expected to share it. And why not – there’s more where that came from. Like any family, as our kids have gown into young adults we have had to learn to share them. Particularly on the holidays. With our oldest married for five years, we are well versed in the trickiness of spreading their holiday time between multiple families, and have tried to allow them to make guilt-free decisions. With one far-flung son out in Washington DC comes the added complexity of travel and extra vacation time required for these occasions. 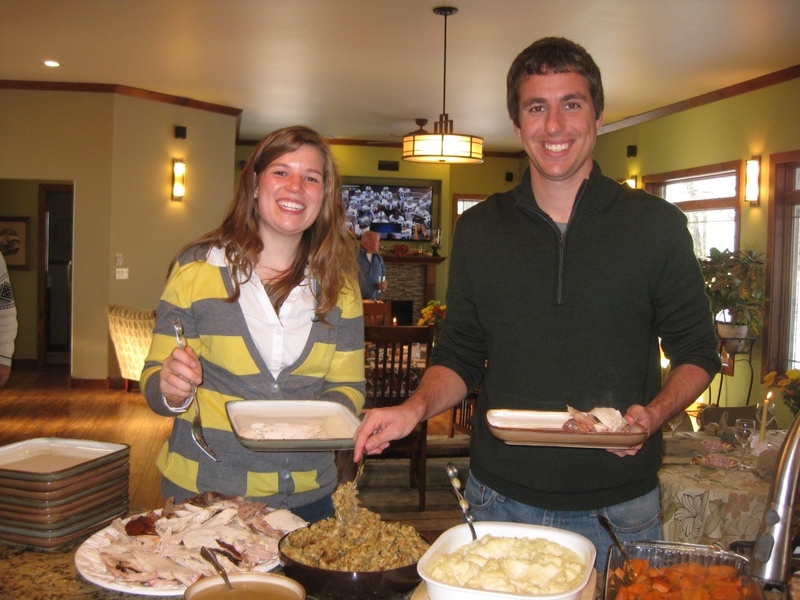 We fully understood when he chose to spend Thanksgiving with his long distance girlfriend, rather than making the trip home. But what came as a complete surprise was her family’s invitation to all of us to join them. Not just Rich and me, but the rest of our kids and grandkids as well. It was an act of sincere kindness that humbled and excited us. We happily accepted. Joining forces with as-yet-unknown-friends proved to be seamless and heartwarming. I maintain that it’s not all coincidence. Carl undoubtedly is drawn to a young woman brought up with similar family values. Enveloped by their warm hospitality, we felt right at home and enjoyed sharing many common experiences, not to mention a wonderful multi-generational Thanksgiving dinner. As if that wasn’t enough, their generousity enabled us to stay for on an additional day to stretch our scarce time with our son. 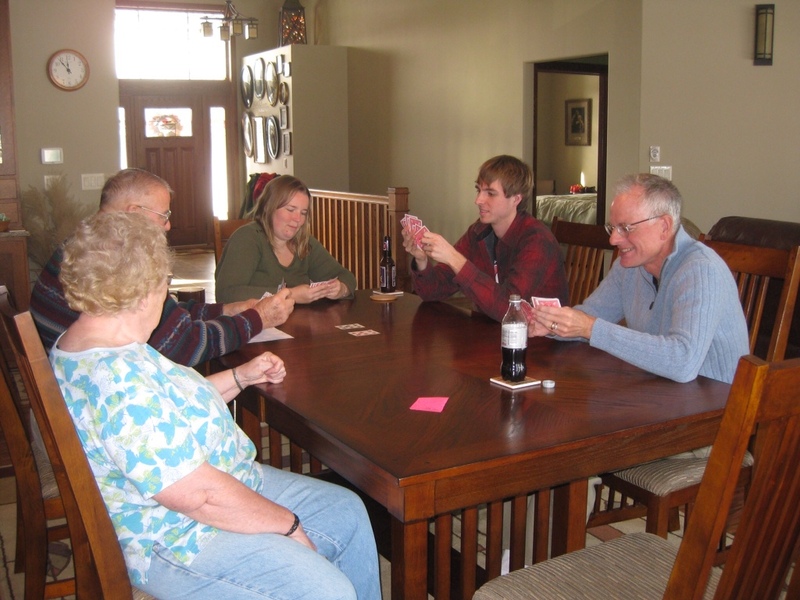 Many games were played, football games watched, Christmas lights installed (with the help of a tractor – we were in Iowa, after all), walks taken and stories told over more meals shared around the table. This Thanksgiving gave us many new reasons to be thankful. For wonderful new friends. For sharing the strength of family. For gathering together from far and wide. For those reaching out with acts of kindness. And for Carl and Chelsea, for being the reason it happened. What to do when the weather’s cold and miserable? It’s that terrible in-between season. Too cold for comfortable cycling. Too soon for snow and skiing. I’ve returned to my old faithful running routine to fill the gap and get in shape for the ski season. Fortunately, I’m fine with running in marginal weather. In fact, once I get out there I rather enjoy pushing through the dreary skies and wet pavement and enjoy running for the pure exercise. But days on end of gloomy weather do invite restlessness. With few mid-week offerings on the cultural scene, I decided we should make our own fun. 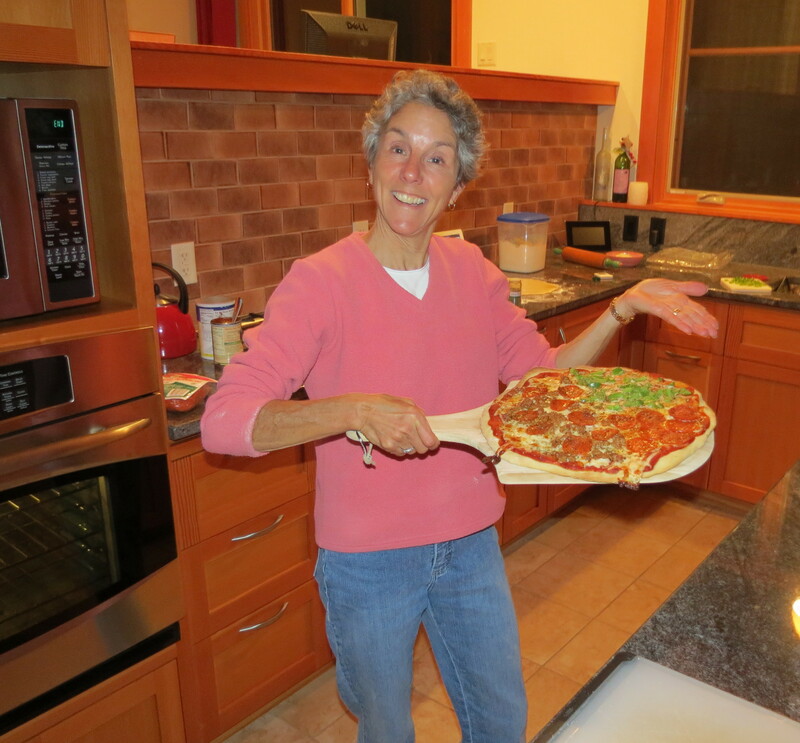 What better cold weather activity than making homemade pizza? Normally, it’s reserved for our traditional dinner on Christmas Eve. I know, kind of strange for the Christmas holidays. But the boys love it, and request it every year. So when they read this, I’m sure they will be envious! It’s really not all that difficult to make, so I’m not sure why we don’t do it more often. I rounded up the ingredients, and prepared the dough. From there, it was a group activity, layering on the toppings and shuffling the pizzas in and out of the oven. Voila! Homemade pizza dinner and a good evening’s entertainment. 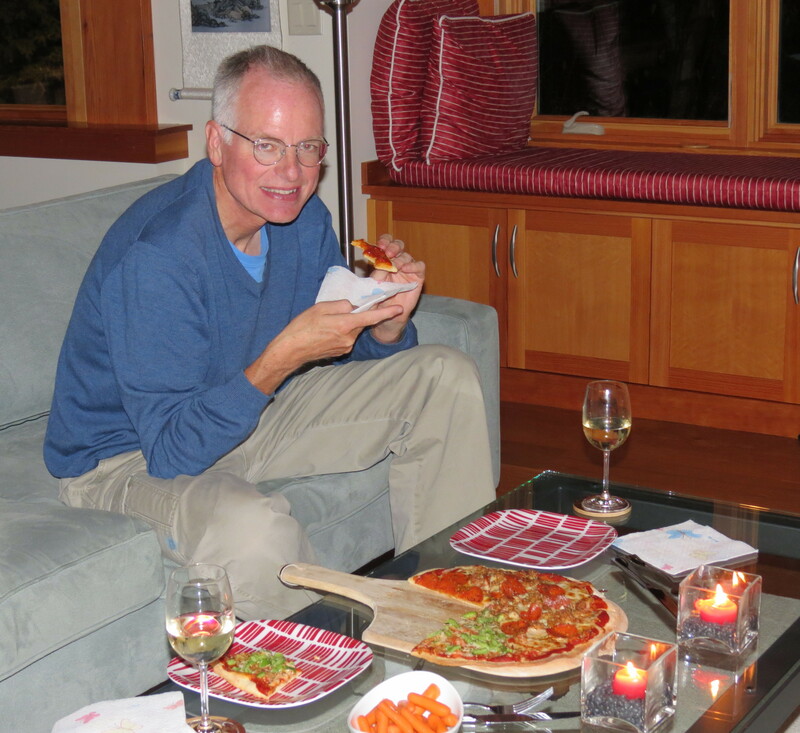 Another rule of pizza, at least when it’s just the two of us – we settle ourselves by the fire in the great room, in more relaxed environs rather than the dining room table. It all started when we were first commuting up to Duluth. We’d arrive in the evening with hot pizzas straight from Sammy’s that we’d consume as soon as we carried in our worldly goods. Now that we’re permanent residents, it’s a ritual we have continued. A good one. The weather is still gloomy, but we did enjoy our pizzas. 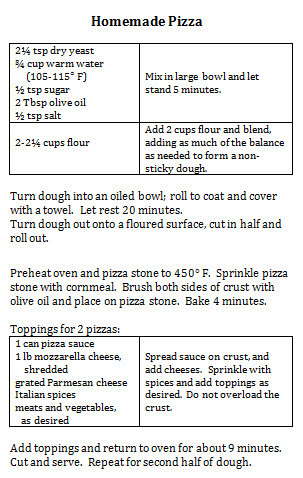 In the event that the sun doesn’t shine for a few more days, here is my recipe for homemade pizza, adapted from a Blackwoods Restaurant recipe.